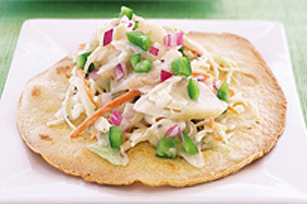 You can use any white fish in this quick tostada recipe. Pick your favourite fish and you are on your way to a fast and fresh fish supper. Preheat oven to 350°F. Spray both sides of tortillas with cooking spray, then place in single layer on baking sheet. Bake 10 min. or until crisp and lightly browned. Heat large nonstick frying pan on medium heat. Spray with cooking spray. Add fish; cook 5 min. on each side or until fish flakes easily with fork. Remove from heat. Use a fork to break up fish into smaller pieces. Stir in half of the dressing. Add remaining dressing to coleslaw blend; toss lightly. Spoon evenly onto crisped tortillas; top with fish mixture, peppers and onion. Use tilapia, perch, halibut, cod or red snapper fillets. Excellent source Vitamin C & Iron. Good source Vitamin A. High Dietary Fibre.